Just about everybody has at least one. Some people have dozens. Chairs are one of those things that are so pervasive in modern life that we don’t take much notice of them until we need them. A chair is, simply stated, an item of furniture designed for one person to sit upon. Wood dining chairs usually consist of four legs, a seat and a back. If there is no back, it is a stool. If it is designed for more than one person, it is a sofa or loveseat. If it is designed for more than one person but it has no back, it is a bench. 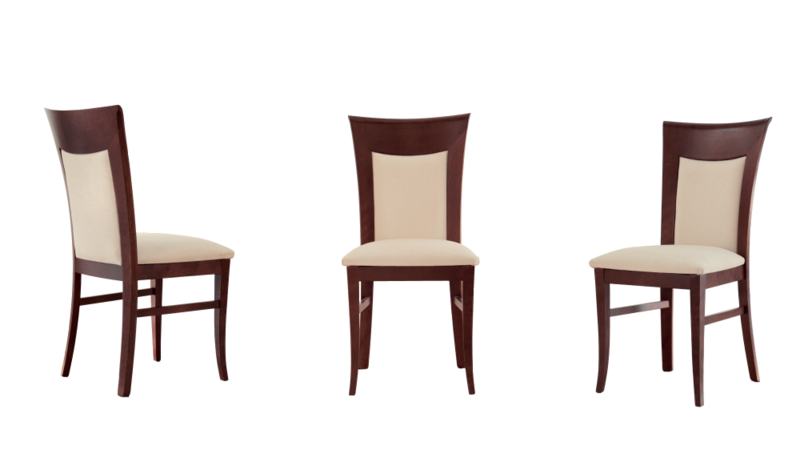 The parts of wood dining chairs may vary in shape and quality but the parts that are most common are, from bottom to top: legs stretchers seat hip rests posts slats rails splats. Learn more about these terms in our furniture term glossary. In this article we will only look at wood dining chairs. We will deal with upholstered dining room chairs in an upcoming article. Quality dining room chairs will have more of the above elements than cheap chairs and they will be constructed of better material using better construction techniques. Learn more about shopping for dining room furniture. When you are shopping for wood dining chairs, your evaluation should begin before you even sit in the chair. Look for the design elements that you are interested in. If you want ornate wood dining chairs , look at the quality and depth of the carvings and turnings. They should be deep and sharp. The least expensive wood dining chairs will often have shallow carvings due to over use of knives and blades on duplicators and worn pressing plates. Look at the seat. Is it deeply scooped? If it isn’t, you can use the chairs to keep dinner guests from overstaying their welcome. Is there a sufficient rake or angle to the back of the seat? A back that is too close to vertical will not be comfortable and combined with insufficient saddling on the seat, will cause you to slide forward out of the chair. Now, look at the construction. Are there stretchers between the legs? The more the better, within reason, of course. If a wood dining chair is made from solid hand carved wood, with mortise and tenon construction and is screwed and glued, it may not need stretchers. Dining chairs of this type will cost much more than your average big box store’s prices. Most lesser priced chairs should have stretchers. The true test is to sit in the chair. Whether or not it has stretchers, the chair should not have any wiggle in it. Items that are not common to all wood dining chairs are hip rests and arms. Hip rests are screwed into the seat and the posts to take some of the stress off the posts. Many Americans, me included, would call hip rests hip pinchers. As Americans have grown wider, hip rests have become less common. Arms should be well secured to the posts and the rails. Arms that are not a structural part of the back, need to have spindles to support them properly. Any wobble is unacceptable on a new chair. Some arms, especially on Windsor style chairs, are made from bent wood and are part of the back. These will have multiple spindles supporting them. Most better quality chairs are solid wood dining chairs and most unfinished solid wood dining chairs have these features. Finally, many wood dining chairs have upholstered seats. We could devote an article to choosing quality fabric and what to look for in an upholstered seat. I believe that a hard bottom seat is superior to a web seat. The padding should be rather dense and fairly thick. The fabric should be fairly thick and durable. Woven fabrics are preferable to painted fabrics and the material should have backing. Cleanability may be important. Learn more about fabric cleaning codes.